Dubai-based property developer Omniyat said it has begun delivering the commercial units at the group's 95-m-high Opus project in Dubai’s Business Bay. 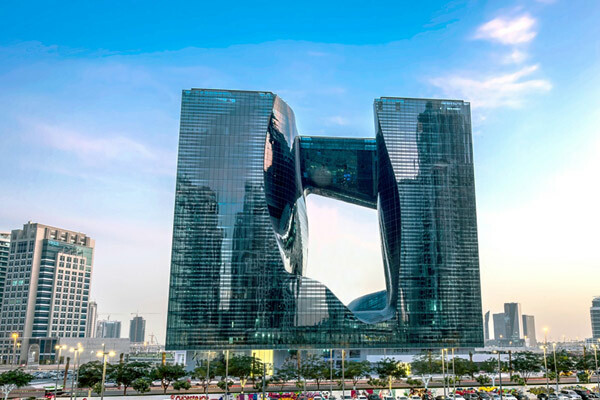 The unique building - which has been designed by Zaha Hadid as two separate towers that coalesce into a singular whole, taking the form of a cube - will house the first ME hotel in the region. Announcing the official opening of its doors for companies, Omniyat said the striking landmark has reached a significant milestone in its completion as businesses have begun taking ownership of its commercial units. Businesses - ranging from multinational Fortune 500 companies to regional creative agencies - have already collected their keys, thus emphasising The Opus’ attraction as a destination for architectural admirers in the heart of Dubai’s Business Bay and Burj Khalifa district, said a top official. Mohammed Hmeid, the sales and marketing director at Omniyat, said: "We’re thrilled to open the commercial spaces of The Opus and to already have several companies setting up their offices. Companies will now begin the fitting-out process to complete their bespoke offices." "As well as the prime address and proximity to Downtown Dubai, Inhabitants of The Opus will also have full use of the building’s state-of-the-art ultra-luxury facilities," he added. Omniyat said the idea of The Opus had always been one to create a multi-faceted experience for clients in one of the world’s most iconic architectural structure in Dubai’s ultimate commercial address. The Opus is uniquely distinct from the famed architect’s list of iconic projects as it is one of her very first projects in Dubai to have been fully designed from an interior and exterior perspective, where every element of the hotel and residential space, recognisable with her signature curves and flowing lines have been handpicked by her complementing the powerful elements of the exterior of The Opus. Omniyat has been working on the project alongside Zaha Hadid Architects since 2008. The Opus is designed as two separate towers that coalesce into a singular whole, taking the form of a cube. The cube is ‘carved’ to create a central void that is an important volume in its own right, providing views to the exterior from the heart of the building. It is this unique design and finish that makes The Opus instantly recognisable and will before long transcend the building into iconic status, said the developer. Omniyat said besides these commercial units, The Opus will also house luxury serviced residences. By the end of next year, ME Dubai hotel will open along with more than a dozen food and beverage outlets. Located within Burj Khalifa district of Dubai, the Opus by Zaha Hadid Architects for Omniyat will house the first ME by Melia hotel in the Middle East. Operated by Melia Hotels International, one of the world’s leading hoteliers with more than 350 hotels in 39 countries, ME by Melia hotels are located in cultural capitals across the globe with their progressive, design-driven approach.